HMP Erlestoke prisoners collaborate with Salisbury cathedral stonemasons on monument as part of Weston College Rememberance activities. 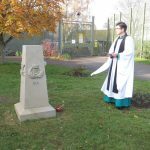 Weston College learners at HMP Erlestoke have collaborated with stonemasons from Salisbury Cathedral to create a WW1 memorial that stands inside the razor-wire topped fences of their jail. 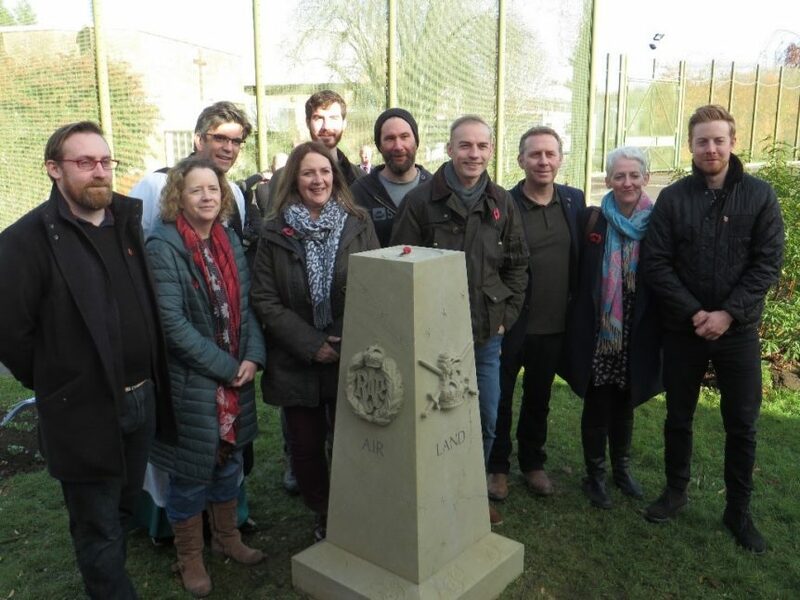 Learners in the Wiltshire prison created the memorial together with seven masons from Salisbury Cathedral, who then carved it out of a block of limestone from a quarry close to the gates of the prison. 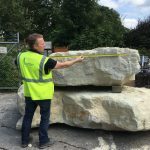 Lee Andrews, head mason at Salisbury Cathedral said: “It has been a real privilege for masons to work on this project and collaborate with the prisoners on their design. 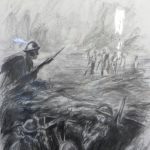 The site chosen for the Erlestoke war memorial is a place that all prisoners pass as part of their daily routine, a lasting reminder of the price paid by earlier generations and what can be achieved by working together as a community. 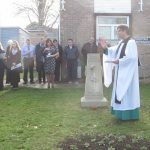 Prisoners and stonemasons met for the first time on Tuesday 13th November 2018 at a dedication ceremony led by the Dean of Salisbury, the Very Rev Nicholas Papadopulos. Previously one of the cathedral’s stonemasons had been able to go into the prison and talk face to face with prisoners. 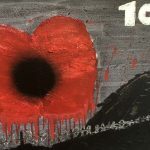 Afterwards, prisoners, some of whom are former members of the armed forces, spoke emotionally about what the project meant to them. Their coordinator, who goes by the nom de plume Jailhouse Moose, said it had been a way of breaking free from the “prison bubble”. “It is tempting to isolate oneself from the outside world, to become wrapped up in a bubble,” he said. “Yes, I am serving a sentence, yes I deserve to be serving that sentence, but it is still my time, it is still up to me to make as much positive use of my time as I can. 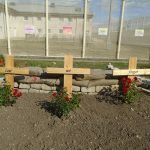 “One of our intentions was to show that the majority of prisoners are trying to find a better version of themselves in here. We are not all drug-taking villains spending our days playing on game consoles. Often the difference between us and those outside is that we reacted in an instant of weakness or pressure. 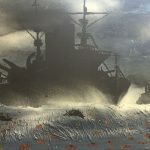 Wayne, who left the military with post-traumatic stress disorder, said the project had given him a feeling of connection with his fellow prisoners and the world outside the gates. “Being in the army meant you were in a team. This was about being part of a team again,” he said. 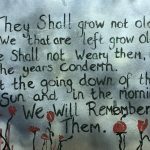 The prisoners came up with the idea as part of a wider regional education and art project organised by Weston College for the World War One anniversary celebrations which culminated in an exhibition of the best of the prisoners’ work at Leyhill Grounds coffee shop. 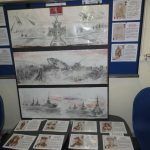 The display is available for the public to view until 16th November when judges will decide the regional winner in each category – Artwork, Short Story and Poetry. The memorial has been placed in a prominent spot next to the visitors’ centre and Rory Stewart, Prisons’ Minister said of the monument “This memorial is a moving tribute to the fallen soldiers who lost their lives bravely serving our country. Governor of Erlestoke prison, Tim Knight said: “There’s no doubt that there are challenges managing a prison like this but that shouldn’t overshadow the remarkable work being done by our dedicated and passionate team. We are committed to working with partner agencies like Salisbury Cathedral to provide intervention programmes, and skill and vocational based training and education to make a difference.